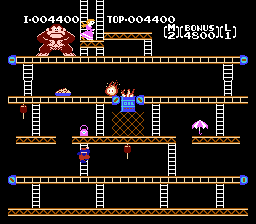 NES Donkey Kong: Original Edition "all items" in 01:33.83 by adelikat. Donkey Kong: Original Edition is an attempt to take the Nintendo Entertainment System port of Donkey Kong and make it more like the arcade original. While still inferior to the original coin-op in terms of cutscenes, graphics, and sound, it has restored the 50M level, which was absent on most home ports.